NEVER place a rear facing child safety seat in the front seat of a vehicle with a passenger side air bag. Place children age 12 years and younger in the back seat in an age and size-appropriate child safety seat or safety belt. If you are the driver, keep 10 - 12 inches between you and the steering wheel. Shorter drivers, who cannot get 10 inches from the steering wheel and still comfortably reach the pedals can purchase pedal extender (call (813) 932-8566 for more information). 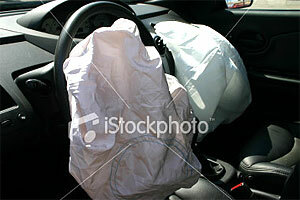 Air bags are "supplemental" to safety belts. Be sure you and your passengers use both the lap and shoulder portion of the safety belt and children ride in appropriate child safety restraints in the back seat. If you MUST disconnect your vehicle's air bag, contact Utah Highway Safety at (801) 957-8570 or visit the National Highway Traffic Safety Administration website at http://www.nhtsa.gov for information.